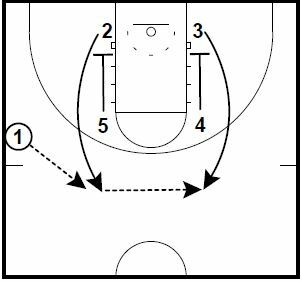 Today’s post is a set with a couple of 3 point shot options. Syracuse Women’s Associate Head Coach Vonn Read submits two plays each month from his book The Basketball Encyclopedia of Plays. You can also see more of his plays in the Related Posts links at the bottom of this post. Vonn has also served as an assistant coach in the WNBA with the Phoenix Mercury, Orlando Miracle, and San Antonio Silver Stars. He was an advanced scout for the Orlando Magic as well as The Charlotte Sting. Even if you don’t run the play exactly as it is drawn up, I hope you can find a way to modify it to fit your needs. This is a good 3-point set for a shooter. The 2 player (Shooter) will cut hard to the top off the Zipper Screen by the 5 player. The 3 player will come up hard off the down screen to get the pass from the 2 player. 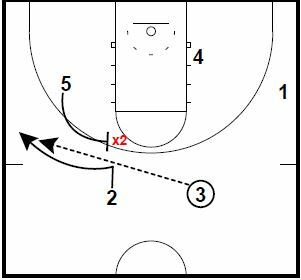 The 1 player will cut hard off the double low stagger screens as an option for this play. The 5 player will set the flare screen for the 2 player, which results in a 3 point shot. 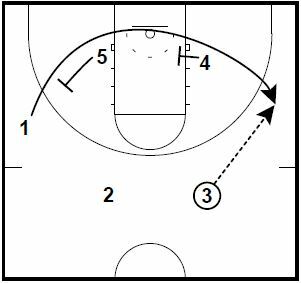 If the flare is not open, you can continue the play with a high ball screen. 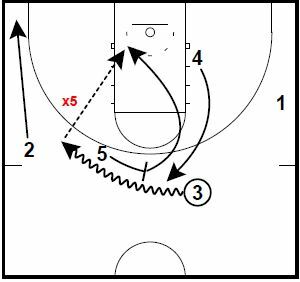 If X5 helps on the flare, they will be late to hedge on the ball screen, which opens up a roll and replace action.